spectrum of topics in evolution with concise, informative, and accessible entries on individuals from shy;Aristotle and Linneaus to Louis Leakey and Jean Lamarck; from T. H. Huxley and E. O. Wilson to Joseph Felsenstein and Motoo Kimura; and on subjects from altruism and amphibians to evolutionary psychology and Piltdown Man to the Scopes trial and social Darwinism. Readers will find the latest word on the history and philosophy of evolution, the nuances of the science itself, and the intricate interplay among evolutionary study, religion, philosophy, and shy;society. 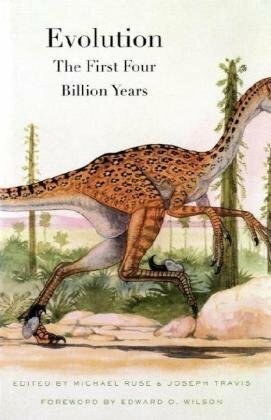 Appearing at the beginning of the Darwin Year of 2009-the 200th anniversary of the birth of Charles Darwin and the 150th anniversary of the publication of the Origin of Species-this volume is a fitting tribute to the science Darwin set in motion. Michael Ruse is Lucyle T. Werkmeister Professor of Philosophy, Florida State University. The author of many books, including The Philosophy of Biology and Taking Darwin Seriously, he is also the founder and editor of the journal Biology and Philosophy. He has appeared on "Quirks and Quarks" and the Discovery Channel. Michael Ruse is Lucyle T. Werkmeister Professor of Philosophy and Director of the Program in the History and Philosophy of Science, Florida State University. He is the founder and editor of the journal Biology and Philosophy, and has appeared on ï¿½eoeQuirks and Quarksï¿½e and the Discovery Channel.Joseph Travis is Dean of the College of Arts and Sciences and Robert O. Lawton Distinguished Professor of Biological Science at Florida State University. He was born in Birmingham, Alabama, in 1929. He is currently Pellegrino University Research Professor & Honorary Curator in Entomology of the Museum of Comparative Zoology at Harvard. He is on the Board of Directors of the Nature Conservancy, Conservation International & the American Museum of Natural History. He lives in Lexington, Massachusetts. Garland Allen is Professor Biology, Washington University in St. Louis .